Tired of watching Lilian Jackson Braun's Koko and Yum Yum get upstaged by that do-nothing Jim Qwilleran? Wish the sleuthing pets in Rita Mae Brown’s tales had even more prominent roles? Morton’s debut, featuring an all-feline cast running amok in something like modern England, is the answer to your prayers. Marcia Woolcoat, the matron of the Furcross home for slightly older cats, offers her residents an unusually comfortable end-of-life option: pillar-to-post group euthanasia, complete with last rites from beautician Oralia Claw and interment in coffins the clients have selected and hunkered down in. She’s so shocked when the bodies of her three latest (pun intended) clients, Vita, Virginia, and Pansy Merlot, are stolen from their newly dug graves that she instantly engages Hettie Bagshot, a former musician who’s just opened the No. 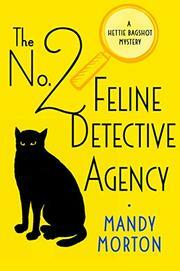 2 Feline Detective Agency, even though Hettie’s never worked a case. Once the three corpses, shorn of their fur, turn up, the detection mostly takes Hettie and Tilly Jenkins, her arthritic assistant, on a round robin interviewing the likes of Furcross resident nurse Alma Mogadon, romance novelist/gardener Digger Patch, haberdashery salesclerk Lotus Ping, and fashionista Cocoa Repel as the ailurocentric world goes on around them listening to Tabby Wynette, watching Cat on a Hot Tinned Roof, reading Alexander McPaw Spit, and waiting for the premiere of Desperate Housecats. The mystery is gossamer-thin, the detective work modest, the characterization ditto, and the puns—well, you already know how you feel about them. But everyone who suspects that cats have always run the world will be at least a bit curious about how that works out in an alternate reality.